Hey, that's me on the left sitting awkwardly next to Dr. Manticore (Kaebel Hashitani representing Geek In The City), Matt Hunter (representing the A Jumps B Shoots podcast), Fatboy Roberts and Cort Webber (of the Cort and Fatboy Show) and we're all talking about podcasting. Off to the left and not pictured was Rick Emerson. Photo by the amazing Ara Roselani. Greetings listeners! 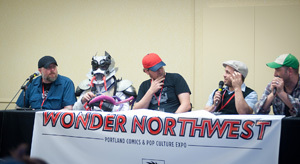 So during the local convention Wonder Northwest, I was part of a podcasting panel with Cort & Fatboy (of the Cort & Fatboy Show), Matt Hunter (of the A Jumps, B Shoots podcast) and Kaebel Hashitani (who represented the Geek In The City podcast as Dr. Manticore). It was hosted by Rick Emerson (The Rick Emerson Show, Legion of News). I asked on Facebook if anyone would be interested in hearing the audio from this episode and the response was positive. I want to reiterate that this is not “clean” supplemental material, but for anyone that wanted to hear said panel audio, here you go. I tried to sweeten the audio as much as possible. “Big ups” go out to Martin Vavra of Galaxy Sailor Productions, not only for being an awesome regular addition to the Kaijucast crew, but also for filming the panel and pulling the audio off the video so that I could post it to my rag-tag Godzilla podcast blog… Thanks, Martin!!! So, yeah… I don’t really like how I look when videoed (surprise! I’m a nerd with some social awkwardness!). Outlook Portland is an entertaining, fast paced, discussion of Portland events, issues, controversies, and culture. Hosted by Portland talk radio host Rick Emerson, and airing on NW32 TV, Outlook Portland features newsmakers and local figures of every stripe in a round-table discussion covering the whole spectrum of local happenings. Host Rick Emerson has been a Portland media fixture for over a decade. Rick has been seen in film, on stage, and is an active member of Portland’s music community. On June 21st, 2010, Rick launched a subscription based internet radio program, The Rick Emerson Show in addition to a free one hour news program called Legion of News. You can find out more at www.rickemerson.com and www.cascadia.fm.